When accuracy is not a concern, then calculate easily by rounding decimals using the number line a versatile visual tool. The pictorial representation helps visualize the position of the decimal on the number line and makes rounding uncomplicated. 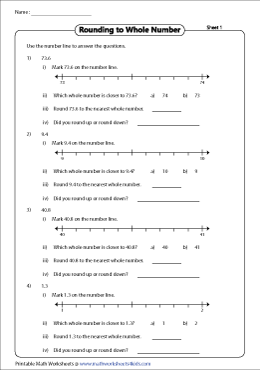 Practice rounding decimals with the pre-printed number lines and round up or round down decimals to the nearest whole numbers, tenths, hundredths or thousandths. Plot the decimal on the number line. Round down the decimal to the nearest whole number if closer to the left and round up if closer to the right or at the center. Test comprehension with the questions that follow. Use the jump strategy to round decimals to the nearest tenth. Indicate the decimal on the number line, skip count to find the nearest tenth, round off and identify if the decimal was rounded up or down as well. 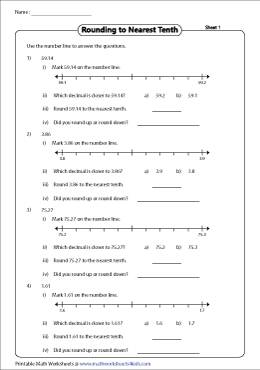 Transit from rounding decimals to the nearest tenth to hundredth with these practice worksheets. Depict the decimal on the number line, locate the thousandths place, round up or down accordingly. Reiterate the concept with these rounding the decimal to the nearest thousandths worksheets. Analyze the number line and round up or down based on the position of the decimal on the number line. 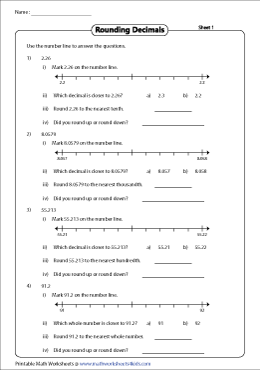 Recapitulate conceptual understanding with these mixed review worksheets. 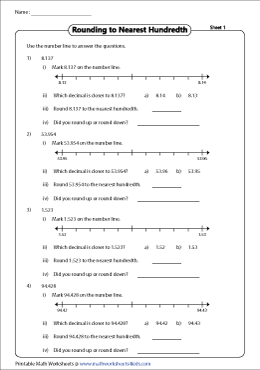 Find a blend of exercises to round off decimals to whole numbers, tenths, hundredths or thousandths using the number line.